Over $405,500 Raised & Donated! FORMER RED CARPET CHARITY PREMIERE REVAMPED AS "DANCING WITH THE CARS!" The Greater Pittsburgh Automobile Dealers Foundation (GPADF) is pleased to announce that the former Red CARpet Charity Premiere will now be called “Dancing with the Cars” and will take place on Thursday, February 16, 2017, from 5:30pm until 11pm, at the Pittsburgh International Auto Show, the night before the auto show opens to the public. This traditional charity fundraiser has become one of the largest charity events in Western PA since the GPADF joined forces with the Pittsburgh Vintage Grand Prix. Last year the GPADF and PVGP presented a record check for $405,500 to the Autism Society of Pittsburgh and Allegheny Valley School. The biggest change in the event will be the ticket price. Formerly $250 per person, tickets will now be only $125 per person and will be 100% tax deductible. And the best news is that all of the quality features of the event will stay the same; great venue to wine, dine and dance among all the new cars, two bands, and many other attractions and celebrity appearances. The GPADF made this decision because they want more people to be able to support and enjoy this important charity fundraiser, and can do so because of their many generous manufacturer and corporate sponsors. Dress code will be “Party Attire” aka “Dress for Fun!” Leave your black tie and tails at home, and come straight from work for the biggest, baddest charity event of the season on Thursday, February 16, 2017 at the David Lawrence Convention Center. Information and tickets are available at DancingWithTheCars.org/tickets.html or call (412) 963-8909. Read the recent article from Blacktie-Pittsburgh about the 2016 Red CARpet Premiere gala. The Red CARpet Premiere held on February 11, 2016 is hosted by The Greater Pittsburgh Automobile Dealers Foundation (GPADF) and is the official kick-off event to the Pittsburgh International Auto Show. Joey is the Outside Linebacker Coach of the Pittsburgh Steelers. Christy is the Founder of the Jasmine Nyree Day Center in Bakersfield, Calif. The couple is co-chairing the Pittsburgh International Auto Show Red CARpet Premiere benefiting Pittsburgh Vintage Grand Prix Charities on February 11. The high school sweethearts spend much of their time with their kids, Jayla, 18; Jasmine, 16; Joey Jr., 15; Jacob, 12; and Christy’s nephew, Willie, 15. When they’re not attending family sporting events and scholastic activities, Joey and Christy enjoy vacationing somewhere tropical. #StartYourEngines: It was a record-breaking year for the Pittsburgh International Auto Show’s event, which benefited the Pittsburgh Vintage Grand Prix Charities. More than 1,000 guests came out despite the blistering cold to check out the amazing cars (including a delicious vintage 1956 Mercedes 300SL Gullwing Coupe that you can check out on my Instagram @nataliebenci), and to raise funds for the Autism Society of Pittsburgh and Allegheny Valley School. The PVGP Charities were awarded $405,500 — a new record. "This is a big night for us. We love presenting this check to the charities and to celebrate it. Just knowing we can help makes everything worthwhile … everything comes together," said Dan DelBianco, executive director of Pittsburgh Vintage Grand Prix. Patrons enjoyed a champagne cocktail reception before the official ribbon cutting. Then, a strolling supper satiated guests admiring the rows of shiny dream cars before indulging in liquid nitrogen flash frozen treats and hand-crafted ice creams. Pittsburgh, February 12, 2015 – The Greater Pittsburgh Automobile Dealers Foundation will host this year’s Red CARpet Charity Premiere, the kickoff of the 2015 Pittsburgh International Auto Show at the David L. Lawrence Convention Center. Proceeds from the event benefit the Autism Society of Pittsburgh and Allegheny Valley School. Steelers Defensive Assistant Coach Joey Porter and his wife Christy will be on hand for the ribbon cutting officially opening the auto show. They will be joined by other dignitaries, as well as Board Members of the Greater Pittsburgh Automobile Dealers Association and the Greater Pittsburgh Automobile Dealers Foundation. The evening’s events include champagne, hors d’ oeuvres, a strolling dinner, the charity check presentation, entertainment and complimentary valet parking. This year’s beneficiaries will receive a check from the combined proceeds of the Pittsburgh Vintage Grand Prix and the Red CARpet Charity Premiere. In addition to the featured cars of the 2015 Pittsburgh International Auto Show, several exotic cars from Lamborghini, Ferrari and Maserati will also be on display. Tickets to attend the Red CARpet Charity Premiere can be purchased online at RedCARpetCharityPremiere.org. "Thanks to our wonderful and loyal sponsors and our new partner, the Pittsburgh Vintage Grand Prix, the 2015 Red CARpet Charity Premiere should prove to be the biggest and best ever, which means that our charities will benefit greatly as well," said John Putzier, CEO for the Greater Pittsburgh Automobile Dealers Association. "The Pittsburgh Vintage Grand Prix and its charities, the Autism Society of Pittsburgh and Allegheny Valley School, are excited to partner with the Greater Pittsburgh Automobile Dealers Foundation and to be the beneficiaries of the Red CARpet Charity Premiere. This partnership will help shift our event into overdrive and will greatly benefit those with autism and developmental disabilities served by our charities," commented Dan DelBianco, Executive Director of the Pittsburgh Vintage Grand Prix Association. Pittsburgh, P.A., – On February 12th, as Honorary Chairpersons of the 2015 Red CARpet Premiere, Joey and Christy Porter will be driving a 2015 red Ferrari 458 Italia right onto the show floor and up to the gates at 6:30 pm, where they will emerge to cut the ceremonial ribbon officially opening the 2015 Pittsburgh International Auto Show at the David L. Lawrence Convention Center. They will be joined by Allegheny County Executive Rich Fitzgerald, former Steeler Charlie Batch, Steeler Bruce Gradkowski and members of the Board of Directors for the Greater Pittsburgh Automobile Dealers Association and Foundation. Joey and Christy Porter will unveil the donation check being given to this year’s beneficiaries: the Autism Society of Pittsburgh and Allegheny Valley School during the Charity Check Presentations at 7:30 pm. Proceeds from the evening, combined with proceeds from the Pittsburgh Vintage Grand Prix have created a record breaking year. Thursday, February 12, 2015 – the Greater Pittsburgh Automobile Dealers Foundation (GPADF) will host its Red CARpet Charity Premiere, their kickoff preview of the 2015 Pittsburgh International Auto Show at the David L. Lawrence Convention Center. Proceeds from the event will benefit the Autism Society of Pittsburgh and Allegheny Valley School. 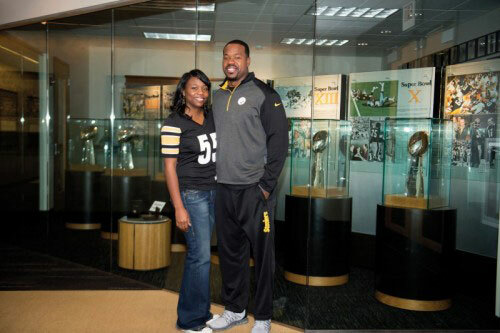 The GPADF is excited to announce that the Honorary Chairs for the evening are Steelers former All-Pro Linebacker and Super Bowl Champion now current Defensive Assistant Coach, Joey Porter and his wife Christy. In 2001, their daughter Jasmine was diagnosed with autism. Autism is a neurological disorder that impairs behavior and communication in approximately one out of every 88 births. More than 4,000 families in Southwestern Pennsylvania have children with this disability." Through our own challenges and experiences, Christy and I understand the importance of supporting these charities, which are committed to providing quality programs and facilities to help those with autism and other disabilities reach their fullest potential in a loving and nurturing environment," commented Joey Porter. "We are so proud and excited that the GPADF became the Presenting Sponsor of the Pittsburgh Vintage Grand Prix and its charities," said John Putzier, CEO of the Greater Pittsburgh Automobile Dealers Association. "We believe that the synergies that have already been created between our organizations will result in a longterm Win-Win-Win relationship; for the GPADF, the Pittsburgh Vintage Grand Prix, its charities and the community at-large." The Red CARpet Charity Premiere is open to the public. Each ticket includes a preview of the Pittsburgh International Auto Show, complimentary valet parking, champagne cocktail reception, strolling dinner, 2 drink tickets, and entertainment from 5:30pm to 11:00pm. PITTSBURGH — September 23, 2014 — The Mario Lemieux Foundation announced today the opening of an Austin’s Playroom at the Highmark, Allegheny Health Network Health + Wellness Pavilion in Wexford. The playroom will serve tens of thousands of residents in the North Hills of Pittsburgh and beyond. 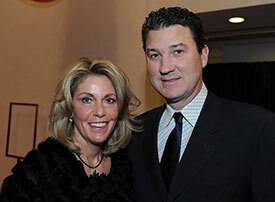 Mario Lemieux, NHL Hall of Famer and Pittsburgh Penguins owner, his wife, Nathalie, and son Austin were on hand for the celebration. "We are so pleased to open the 30th Austin’s Playroom." said Nathalie Lemieux. "Our goal is to reach as many people as possible, and we are thrilled to bring Austin’s Playroom to the Health + Wellness Pavilion." Each Austin’s Playroom features comfortable child-sized furnishings, as well as games, toys, books, electronics, an aquarium and child-friendly artwork. Austin’s Playroom was uniquely and personally designed by Nathalie Lemieux and features a train table, wall-mounted games, sand table, and large screen TV, inside a brightly painted room. Nathalie Lemieux serves as Chair of Austin’s Playroom Project, and each room is called Austin’s Playroom. The playroom was established by a generous donation from the Greater Pittsburgh Automobile Dealers Association. "It is donations like the one from the Greater Pittsburgh Automobile Dealers Association that allow the Lemieux Foundation to continue to build playrooms throughout western Pennsylvania," said Nancy Angus, Executive Director of the Mario Lemieux Foundation. "We are honored to have the support of the GPADA." John Putzier, CEO of the Greater Pittsburgh Automobile Dealers Association and members of the Association’s Board of Directors were on hand for the dedication. Mr. Putzier stated that they were proud to be a part of making another Austin’s Playroom possible through the generosity of their dealers, sponsors, and the public who attends the Red CARpet Charity Premiere of the Pittsburgh International Auto Show. The Greater Pittsburgh Automobile Dealers Association is a metro dealer association representing over 200 franchised automobile and truck dealers and related industries in Allegheny, Armstrong, Beaver, Butler, Fayette, Washington, Westmoreland and other surrounding counties in western Pennsylvania. GPADA, founded in 1924 as a non-profit organization, encourages and promotes trade and commerce by providing and supporting various services, educational and training programs for the benefit of their membership. Pittsburgh, PA – The Pittsburgh Vintage Grand Prix Association is pleased to announce that the Greater Pittsburgh Automobile Dealers Foundation (GPADF) is the new Presenting Sponsor of the Pittsburgh Vintage Grand Prix. The GPADF is the independent philanthropic arm of the Greater Pittsburgh Automobile Dealers Association (GPADA). In conjunction with this announcement, the GPADF has designated the Pittsburgh Vintage Grand Prix and its charities as the beneficiary of its Red CARpet Charity Premiere held February 12th, 2015 at the David L. Lawrence Convention Center. Thank you to the more than 700 patrons who braved snow and ice to attend our 2014 Red CARpet Charity Preview gala! 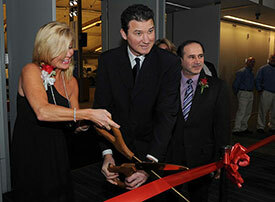 Penguins owner and hockey legend Mario Lemieux and his wife Nathalie were joined for the official ribbon cutting to begin the festivities by Pittsburgh Mayor Bill Peduto, Allegheny County Executive Rich Fitzgerald, Congressman Mike Kelly, Congressman Tim Murphy, Congressman Keith Rothfus and Board Members of the Greater Pittsburgh Automobile Dealers Association and Foundation. Later the Mario Lemieux Foundation was presented with a check for $100,000 dollars to benefit Austin’s Playroom Project, an initiative of the Mario Lemieux Foundation. The Ford display was buzzing with the sounds of Beatlemania Magic and attendees enjoying the Sim-Zilla racing simulator during the Red CARpet Charity Gala at the Pittsburgh International Auto Show. 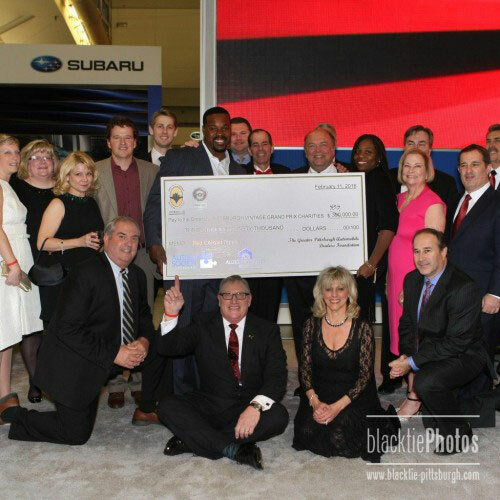 The Greater Pittsburgh Automobile Dealers Foundation presented checks to 15 different charities on Valentine’s Day at the 2013 Red CARpet Charity Preview Gala held at the 2013 Pittsburgh International Auto Show. Each member of the GPADA Board of Directors presented checks to the charities of their choice, followed by the grand finale check for over $100,000 to the Mario Lemieux Foundation to benefit Austin’s Playroom Project. Presenting the check was Gregg Semel, President of the GPADF, Mark Smail, Chair of the Auto Show, Dennis Baglier, President of the GPADA (not pictured) and John Putzier, CEO of the GPADA. Receiving the check for the Austin’s Playroom Project was Mario and Nathalie Lemieux and Tom Grealish, President of the Mario Lemieux Foundation. The 2013 Red CARpet Charity Preview Gala is beginning to take shape. Enjoy a special celebrity filled evening with your valentine as you dine and dance among the hot new cars! We are excited to announce that last year’s featured entertainment is back by popular demand! You will want to get your tickets early to be sure you catch Patrice & The Show’s exciting performance! For more information on this year’s entertainment, please click here. We have many sponsorship opportunities for your company or business. Go to our sponsorship page for more information about how your business can be showcased at and be a part of the 2013 Red CARpet Gala. Please click here. Enjoy a special celebrity filled evening with your valentine as you dine and dance among the hot new cars at next year’s 2013 Red Carpet Charity Preview Gala! Please check back for more details. Please view our full photo gallery from the 2012 Red CARpet Charity Preview Gala! 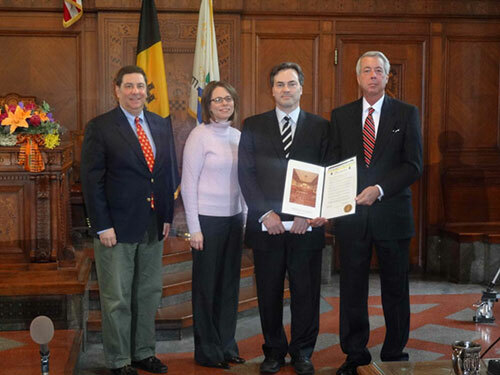 Pittsburgh, PA – February 9, 2012 - We are pleased to announce that The City of Pittsburgh (Mayor Luke Ravenstahl and City Council) will be issuing a Proclamation commemorating the comeback of The Red CARpet Gala Charity Preview in Council Chambers on Tuesday, February 14th at 10am. 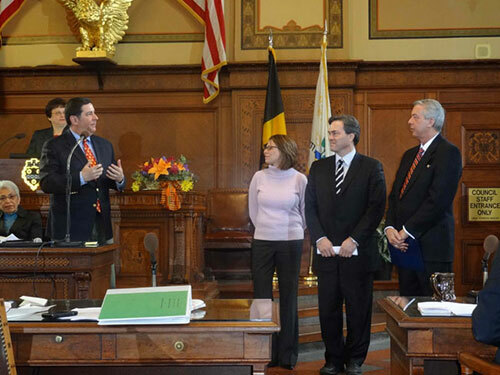 In attendance to receive the Proclamation will be John Putzier, CEO of the Greater Pittsburgh Automobile Dealers Association (GPADA), Mark Smail, President of the GPADA, Tom Rohrich, member of the Board of Directors of both the GPADA and the GPAD Foundation, and Nancy Angus, Executive Director of the Mario Lemieux Foundation. The designated beneficiary of the Red CARpet Gala is Austin’s Playroom Project, an initiative of the Mario Lemieux Foundation. The Red CARpet Gala Charity Preview will be held at the 2012 Pittsburgh International Auto Show (David Lawrence Convention Center) on Thursday, Feb. 16th and will be attended by Mario and Nathalie Lemieux and many other dignitaries and VIPs. The VIP event is from 5:30-7:00pm followed by the full Gala from 7-10pm.